I couldn’t wait to see the Olympic park in all its late summer glory when I visited for the 2012 Paralympic Games. 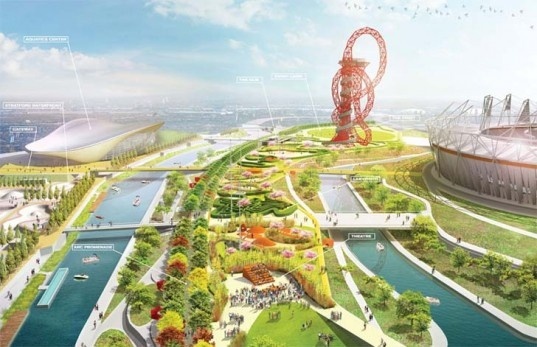 Its been a long time coming and I remember browsing round Landscape Architecture Masters Exhibitions 4 years ago, where many of the students had chosen the Olympic park as their Masters design project. It was finally time to see the real thing! The Masterplanning and Detail design for the Olympic park was developed by teams from LDA Design (UK) and Hargreaves Associates(US) . 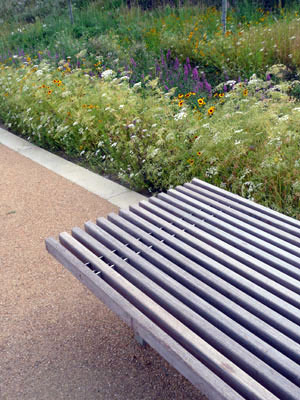 The design of the gardens was a collaboration between James Hitchmough and Nigel Dunnett and Sarah Price. Hitchmough and Dunnett developed the concept of the gardens and the plant lists and specifications and Price was responsible for the spacial design including the detailed planting design and layout within the gardens. Hats off to all involved on a really successful result. 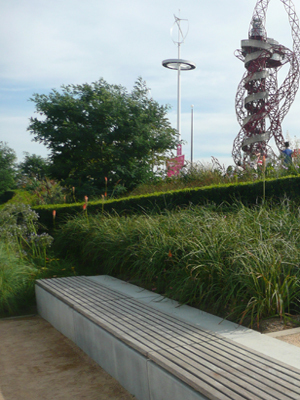 Whilst exploring the Olympic park, it struck me how many cleverly designed spaces there were for visitors to relax, sit and enjoy the gardens and green space. 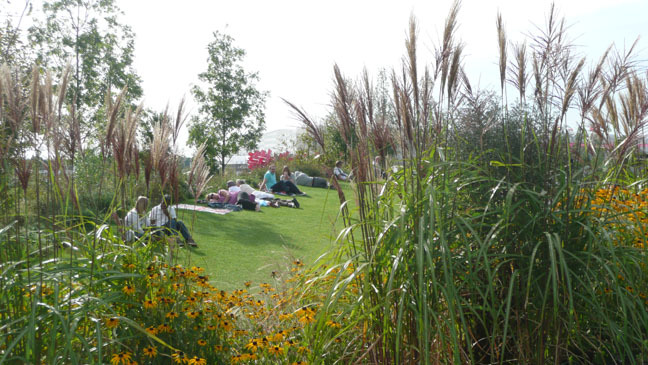 There were hillocks to provide long reaching views of the area, well maintained grass areas for sitting in a beautiful setting, many well designed, structural benches and places for people to gather amongst beautiful exciting planting schemes. Perfect to escape the crowds and bustle of the main thoroughfares. It was a sunny day when I visited and it was obvious how successful the gardens were by the number of people enjoying themselves in the beautiful surroundings. Well done to all the maintenance crew. It cant be easy mowing the hillocks at night! 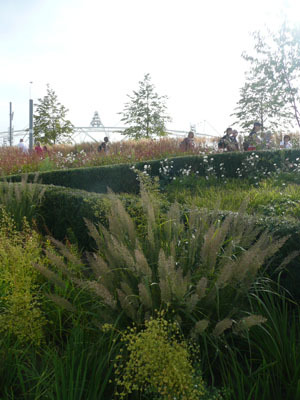 The planting schemes had strong, structural lines that flowed through the entire design and were exploding with colour and excitement. 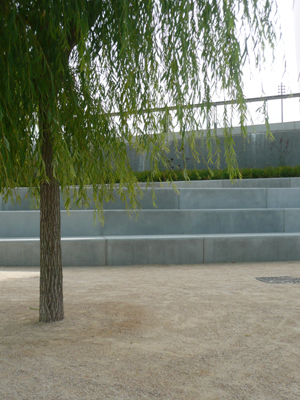 The structural lines were provided by elements like clipped box hedge, swathes of grasses or seating benches set into the landscape. 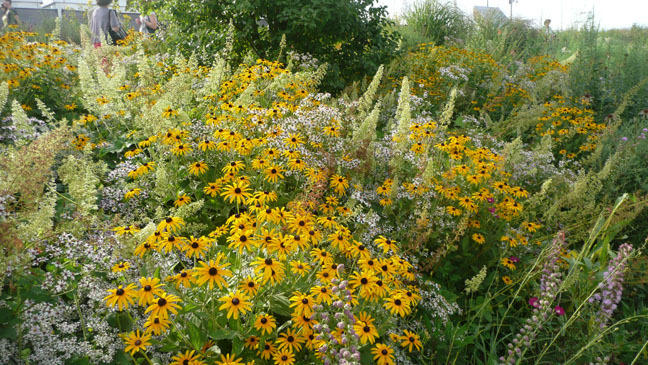 At every turn of a corner there would be another mass of colour where mixed planting covered a hillside, with late summer perennials and grasses taking centre stage. Loved the prominent “GOLD” theme in a number of areas. 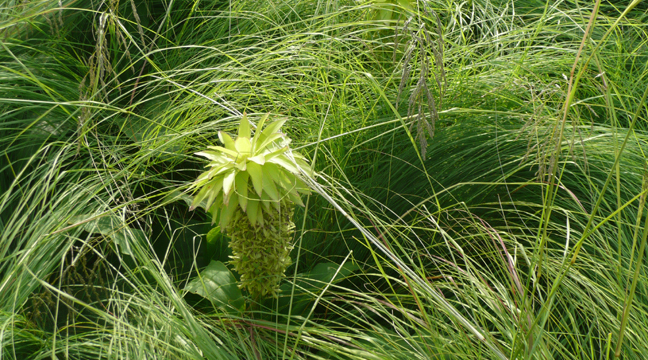 In the 2012 gardens, there was a great bringing together of the countries botanically. I could even smell home (South Africa) with the Tulbaghia in flower in the Southern Hemishpere gardens. What a triumph to take a toxic, derelict, wasteland area and turn it into a beautiful, ecological, accessible outdoor space for future generations to share. The ‘post Olympic’ design for the area was opened to a competition in 2011. The competition was won by James Corner from the US (Designer of the High Line in New York) and London-based Erect Architecture. James Corners team will design the south end of the park linking the Orbit sculpture, the landmark Aquatics Centre, the Olympic Stadium and the London 2012 Gardens. Erect Architecture will design the more wildlife-focused north end of the park alongside the River Lea with its waterways, green spaces and paths. I look forward to seeing the redevelopment of the area and for the community to be able to enjoy these beautiful gardens long after the athletes have gone. For some interesting reading on the future plans for the area, visit the land8 blog on this link.